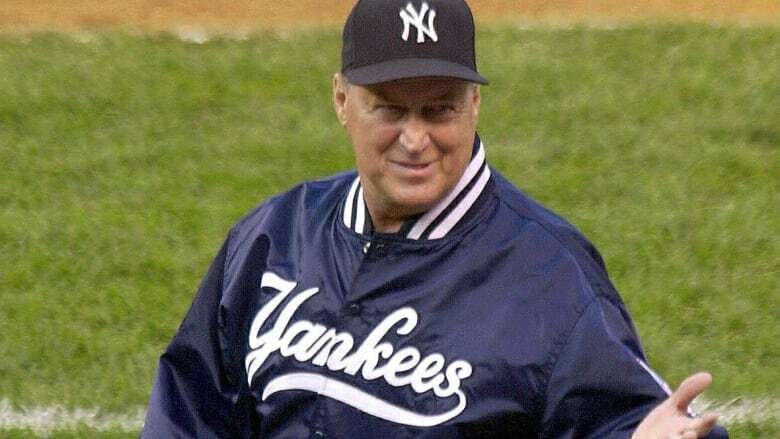 Longtime New York Yankees pitcher and pitching coach Mel Stottlemyre died Sunday in Seattle from cancer. He was 77. Stottlemyre is survived by his wife, Jean, and two sons, Todd and Mel Jr., both former major league pitchers. Longtime New York Yankees pitcher and pitching coach Mel Stottlemyre died Sunday in Seattle after a lengthy battle with cancer. He was 77. When Yankees scout Eddie Taylor discovered him at Yakima Valley Community College and signed him to a $400-per-month US contract. He reached the big leagues in 1964, after a 13-3 season in triple-A, when the Yankees were in a pennant race with a pitching staff plagued by injuries. He turned into the ace of the staff, and by the time he retired in 1974, he'd compiled 164-139 lifetime record in 360 games, starting all but four of them. He had a career ERA of 2.97 and threw more than 250 innings in nine of his 11 seasons with the Yankees. My first <a href="https://twitter.com/MLB?ref_src=twsrc%5Etfw">@MLB</a> All Star at bat was a home run off <a href="https://twitter.com/Yankees?ref_src=twsrc%5Etfw">@Yankees</a> Mel Stottlemyre. He was a class act and served the pinstripes well. Rest In Peace Mel. "Beyond his tremendous accomplishments as a player and coach, Mel Stottlemyre was beloved for his class, dignity and fighting spirit," Yankees managing general partner Hal Steinbrenner said in a statement released by the team. "His contributions to different eras in our history guided us through difficult times and brought us some of our greatest all-time success. "As a result, Mel's popularity transcended generations, all of whom thought of him as their own. His plaque in Monument Park will forever serve to celebrate the significance of his legacy." He was a three-time 20-game winner and a five-time all-star selection. In 1977, he joined the Seattle Mariners organization as a roving pitching instructor, and before the 1984 season, the Mets hired him as pitching coach, where he worked with Dwight Gooden, Ron Darling and Sid Fernandez during his 10 seasons with the team. He never won a World Series as a player, but he was part of the 1986 Mets team that won the title. After two years with Houston, Stottlemyre joined new manager Joe Torre with the Yankees in 1996, where he led a pitching staff that helped the Yankees win four World Series in five years. He resigned after the 2005 season, agitated with then-team owner George Steinbrenner. He worked despite being diagnosed with multiple myeloma in 2000 and underwent multiple treatments, which sent the cancer into remission. It recurred in 2011, and he continued to battle the blood-marrow cancer throughout his remaining years. On Oldtimers Day in 2015, a plaque honouring Stottlemyre was unveiled in Monument Park at Yankee Stadium. "Today in this stadium, there is no one that's happier to be on this field than myself," he said, choking up. "This is such a shock to me because the era I played in is an era where, for the most part, the Yankees have tried over the years, I think, somewhat to forget a little bit. … If I never get to come to another Oldtimers Day, I will take these memories and I'll start another baseball club, coaching up there, whenever they need me." Stottlemyre is survived by his wife, Jean, and two sons, Todd and Mel Jr., both former major league pitchers. The couple's third son, Jason, died in 1981 of leukemia.